Mrs. Ruth Spindler (nee Proctor) used to live in Bishopthorpe and, as a young child, attended the Archbishop of York’s School during the Second World War. She now lives in America but keeps in touch through the Bishdot website. Ruth has kindly let us share her amusing school-day memories – when life was just a little different! Archbishop of York’s School photographed in 1949. Just out of shot on the left is where the air-raid shelter stood. 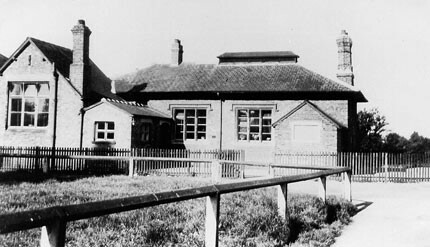 I went to the Archbishop of York’s CE School, Bishopthorpe, from c1942 – 1949/50, in the old brick buildings you see on the photo. In the mornings, during the war, we had to line up outside to receive our cod liver oil dose. We were also given milk every day. During an air-raid siren, the whole school had to go to the bomb shelter on the village green across from the school and we sat in the dark with gas masks on until the all-clear. I think the whole school was packed into there – as well as the teachers – I was pretty young, maybe 5½. When we had to go there during an air-raid, it was totally black inside and smelled strongly of urine! I recall some of the boys used their gas masks to make rude noises – noises like someone going to the lavatory!! A Miss Taylor was our teacher in baby class, and if any boy misbehaved, she would smack them on the backs of their bare legs with a ruler; if girls misbehaved, she rolled up your sleeves and smacked your arms. In baby class, we used small blackboards – some of which were too shiny for the chalk to make good marks. We also had to have a nap in the afternoon by laying our heads on our desks. Mr. Roberts was the head master and I recall he made glue in a large pot, stirring it frequently. ‘Gaffer’ Roberts’ was quite jovial but he would give you a smack sometimes. We had all kinds of crafts. I recall making little mats with raffia on a cardboard template. I still have my ‘duchess’ set made from pink cotton with blue bias binding; I designed my own embroidery pattern of a swan and bulrushes – one oval mat and two small round mats for the candlesticks. I also made an apron, with the available pink cotton, with green and blue. I was lucky to win some prizes – Enid Blyton books with my name inside – I think my mother tossed them out! Also, as a child, the school requested that we pick rosehips from the hedgerows and we took our filled bags to the school and received 3d [about 1.25p] for them. They were sent to be used for rosehip syrup. On another occasion in October I think – I went with other kids to pick potatoes. Can’t remember if we got paid. Talk about child labour! It was lots of fun anyway. 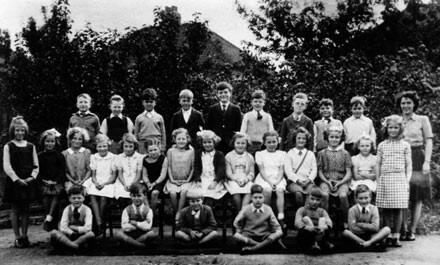 Ruth’s class photograph taken in 1946. She is in the middle row, fifth from the left. Class teacher Miss Mathews is in the back row on the right.